Cooked and roasted chicken wings coated in a sweet and smoky barbecue tomato glaze. Tasty and ready to eat hot or cold. Sticky and sweet British barbecue chicken wings are the ultimate finger food. Easy to prepare and good to share, they’re a hit at parties or picnics and a must have for big nights in with a movie. To serve hot, simply heat the Barbecue wings in the oven ready tray and try serving with cheese & bacon potato skins, a big family bag of salad and a multipack of dips. 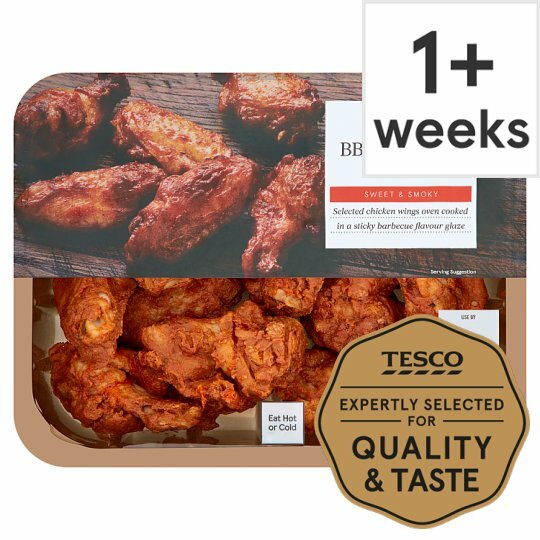 For more chicken recipes check out Tesco Real Food. Chicken Wings, Sugar, Cornflour, Tomato Powder, Rice Flour, Spices, Salt, Potato Starch, Garlic Powder, Stabiliser (Sodium Triphosphate), Chilli Powder, Onion Powder, Smoked Salt, Sunflower Oil, Caramelised Sugar Syrup, Spirit Vinegar, Yeast Extract, Maltodextrin, Rapeseed Oil, Oregano, Tamarind Concentrate, Concentrated Lemon Juice. Instructions: Place the wings in the tray on a baking tray in the centre of a pre-heated oven for 32-35 minutes tossing the wings halfway through the heating time. Place the tray onto a microwaveable plate. Heat on full power for 3 minutes (800W / 900W). Heat on full power for a further 2 minutes to 2 minutes 30 seconds (800W) / 1 minute 30 seconds to 2 minutes (900W). Defrost thoroughly for a minimum of 12 hours in the refrigerator.Once defrosted use on the same day and do not refreeze.Follow the preparation guidelines above.